Ancient dwarf human species found in Indonesia might become extinct faster than previously expected. This was revealed by an international team of scientists investigating the origins of the discovery in the journal Nature. Flores man, or Homo floresiensis lived on the island of Flores. The human brain is the size of a pygmy chimpanzee brain, but the shape of the skull resembles Homo erectus, which lived in Africa and Asia. They also have long arms and short legs. The team of scientists correcting earlier reports stating that the inhabitants of the island of Flores in the past that coexisted with modern humans for tens of thousands of years. They found that the youngest age for the species Homo floresiensis, nicknamed Hobbit Man was about 50,000 years ago, not 13,000 and 11,000 years as the initial claims. 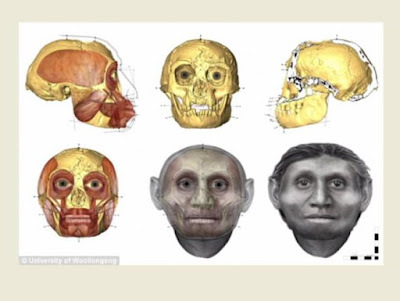 The study was led by scientists from the Indonesian National Archaeology Center (Pusat Arkeologi Nasional/Arkenas) involving researchers from the Research Centre of Human Evolution (RCHE) Griffith University, Australia. The researchers found a problem with the efforts of the previous calendar in the Liang Bua cave site. "Even seemingly Homo floresiensis seems to have disappeared shortly after our species reached Flores. It shows that 'kita' the one who delivers them to extinction, "said the expert geochronology and archaeologist in RCHE, Maxime Aubert. He shared RCHE Director, Professor Rainer measure the amount of uranium and thorium contained in H. floresiensis fossils to test their age. "The skeletal remains of the youngest Hobbit comes from 60,000 a year ago, but the evidence for their simple stone tools continued until 50,000 years ago. After that, there was no trace of this hominin species, "said Aubert. 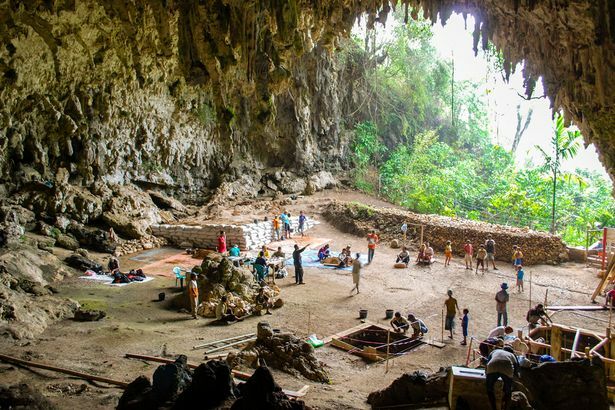 The Flores man discovery began when archaeologists dig at Liang Bua limestone cave in 2003, they found the bones of a human dwarf that is different from the human species today. It is not clear their position in the human family tree. They may be descended from ancestors that normal height, which is undergoing a process of evolution shrinking her height being isolated on the island. Hobbit making stone tools, were found along with the remains of the skeletons in the cave of Liang Bua, Flores. But the excavation covers only a small portion of the area of ​​the cave is a vast and complex. Further excavations over the years eventually led investigators on a clearer understanding of the sequence of archaeological layers. Now it is clear that when the previous team collected samples for dating main layers containing the Hobbit fossils, they mistakenly take it from the layers above it which same, has similar composition, but much younger. "This problem has been corrected and a new calendar published giving a more reasonable estimate of the antiquity of this species," said Aubert. But, what happens to the Flores man still remains a mystery. Adam Brumm, an archaeologist of RCHE who also participated in the study said Hobbit tend to have inhabited other caves on Flores that can generate new signs of their existence. He believes H. floresiensis may suffer the same fate as Neanderthals in Europe. Both species are unable to compete with our species, and is replaced in just a few thousand years.